Grand Canyon National Park is located at the northwestern part of Arizona in the United State of America (U.S.A). It is one of the most famous and tourist destinations in the world. The Grand Canyon is 277 miles (446 km) long, up to 18 miles (29 km) wide and attains a depth of over a mile (6,093 feet or 1,857 meters). It is a steep-sided canyon carved by the Colorado River. President Theodore Roosevelt visited in 1903. “Grand Canyon” was officially designated a national park on February 26, 1919. Here are 10 quizzes about Grand Canyon National Park. How did the Hisatsinom people (Early residents of the Grand Canyon) obtain their food? The hisatsinom , who are the abcient relatives of the Hopi Indians that some archeologists incorrectly call the Anssazi, farmed the somewhat harsh surface of the Grand Canyon, yielding corps such as corn, beans and cotton. Crude pictograms from the Hisatsinom still remin etched in the giant distinctive walls of the canyon. According to researchers, when did the Colorado River begin to cut through the upper layers of rock? Who was the first European to visit the area? Spanish explorer Francisco Vásquez de Coronado explored the area about 1540. When was the Grand Canyon National Park established? Which exploring president was a champion of the Grand Canyon and became a regular visitor at the park, calling it the “the one great sight … every American should see”? 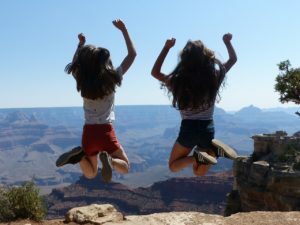 As of 2005, what was the most common cause of death for tourists visiting the Grand Canyon? According to Grand Canyon Emergency Chief Ken Phillips , the majority of park deaths come when hikers of all ages do too much, too fast.With summer temperatures soaring at 120 ° F (49°C) in the bottom of the canyon, heat exhausation can overwhelm hikers. Add in the toughest part of the hike. What is the name of the tower at South rim in Grand Canyon ? This is the Desert View Watchtower which is located on the South Rim. The four story structure was completed in 1932. When is the North Rim closed? It is closed from fall to spring. It closes only when avalanches block access. The North Rim at an average height of 8,000 ft is higher than the South Rim by 1,000 ft. The Colorado runs 277 miles long and continues to erode the canyon. Which is the most visited rim at Grand Canyon?